The most comprehensive course you can find! Includes Botox and Fillers, Sclerotherapy, The Business of Medical Aesthetics and Cosmetic Lasers & Microdermabrasion. 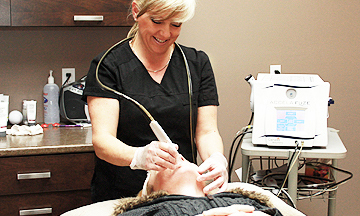 Learn the fastest growing, and one of the most potentially profitable cosmetic procedures in North America! This fully hands on introductory course provides you with everything you need to work on patients right away! This two day hands on training session is provided by Dr. Martin for physicians and/or nurses who are interested in entering the field of sclerotherapy, and wish to learn the basics from an experienced practitioner. A highly practical and straightforward introduction into the potentially confusing area of cosmetic lasers. Lasers are the number one area where physicians and nurses overspend because they don't know the business. Take your skills to the next level with our advanced techniques. This course is for those who have completed an introductory course and at least 6 months (or 40 cases) of clinical experience with neuromodulators and fillers within the last 2 years. "Thank you for your thorough and thoughtful program. We had many opportunities to view different clinical issues, the working and treatment, and had the chance to develop our skills with confidence. Your exceptional staffs made the program run smoothly and I personally felt welcomed by them. Your tutelage was superior and I look forward to another time when I might acquire even more advanced skills... Joseph T. Gleeson M.D., C.C.F.P. I left with the tools, confidence and ability to start up my own practice immediately. The hands-on experience was tremendously valuable. Dr. Martin is a wonderful teacher - no one gets left behind and her enthusiasm is infectious! This is a fun course and although it is intensive, I enjoyed myself thoroughly and had the opportunity to meet colleagues from different parts of the world whose focus was similar to my own. Dr. Andrew Jackson, M.D. Training for Medical Professionals Doctors, Nurses & Nurse Practitioners the world over! 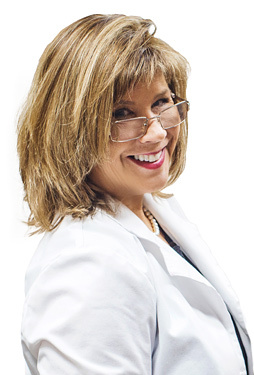 Dr. Deborah Martin and her team of physicians, nurse practitioners and Medical Aesthetics nurses are recognized worldwide for their in-clinic training programs through which they have passed on their skills and experience to more than 1,000 physicians and medical support staff from around the world including China, USA, Hungary, India, U.K., Australia & The Bahamas. 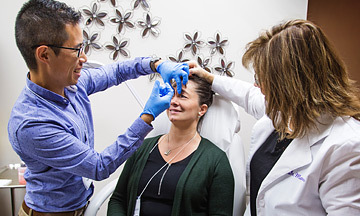 Every course run at Dr. Martin's Rejuvenation Centre is accompanied by a full course manual, online training videos, photos, client pamphlets, and a supply list. Please note that all students are expected to watch the pre-course videos and read all of the training materials before attending their choice of course of study. This is how we manage to create a 100% hands on learning environment when our students arrive! "The Value of Doing Dots"
The two key differences in our training programs are the fully hands-on experience and our artistic approach to all aspects of Medical Aesthetics. We do not rent hotel conference rooms to be filled with dozens of doctors, all watching procedures on a big screen. At Dr. Martin's Training Centre, all students are expected and required to be ready on day one to step up to the plate and learn by doing, on live volunteer patients, since they will already have had several weeks to review the theoretical material. You cannot learn how to take on a task as delicate as Botox and filler injections simply by watching somebody else. You must to do it, be told what you are doing wrong, and be advised how to improve your technique. No matter if you are learning how to drive a car or build furniture, there is no substitute for practical hands-on experience. This is especially true for a physician or other medical professional working in any field of medicine. The patient is trusting that you know what you are doing, that you are skilled and experienced, and that you have the qualifications to help them. That is, after all, why we all did our time as students in the field. The reason we know our students can just jump in is because we have given them weeks to prepare, by sending to them everything they need to be ready before they walk in our door. The simple fact is that the effects of our work are measured in years...both in visual and psychological effect. More than 50% of Canada's population is now over forty. Nonetheless, as we grow older many people, especially women, begin to feel less valued due to the natural effects of aging; especially as they, and their partner, are bombarded constantly with the social message of "Youth is best". A great number of them are facing significant changes in their lives, such as marriage, divorce, separation or searching for a new job. That growing majority sector of our population establishes a consistent and expanding market for any medical professional entering the field of Medical Aesthetics. The methodology behind success in practicing Medical Aesthetics must be to improve the patient's confidence and feeling of self-worth through the application of techniques that improve their outward appearance. It is that attitude that keeps a client returning to your clinic. Any medical professional can be trained in the techniques of injecting botox and aesthetic fillers, but that simple pearl, that we have confirmed as the result of having aided thousands of patients over a period of more than fifteen years, is what will make or break any physician or medical professional entering this delicate field. Many women who are now entering middle age feel they sacrificed the "best" years of their lives to their families, and now that they have entered that time in their life when they should be feeling settled and confident, finally, there is "me" time for them. Botox and fillers can rectify those issues. In addition, they can help totrain the patient not to overuse the muscles that caused the uncomplimentary effect. To be successful in this growing and very lucrative field the practitioner must listen to the patient, be knowledgeable about options, and seek to truly understand the patient's underlying needs and desires. Greater Job Satisfaction. More Free Time. Improved Wealth. That kind of wisdom and diversified practical experience cannot be synthesized through mass corporate seminars. Over the past 15 years, as we have perfected our own skills and techniques, we have assisted hundreds of health care professionals from all over the world to attain those pearls of knowledge that would aid them to become confident and competent in the artistic application of this very enriching area of medicine. Perhaps as important, we have assisted them in avoiding some of the major pitfalls both medically and financially. Learning aesthetics our way results in greater job satisfaction, more free time, and improved wealth. All courses satisfy the Provincial and Federal requirements for medical training. All students will receive certificates that are suitable for framing for each course completed. Students will also receive a detailed description of the course for presentation to licensing bodies and injectable manufacturers. The training staff are available to students for questions after taking a course via phone or email. We have discovered, after years of refining our courses, that this is the most efficient style of teaching for a variety of learning types. Value Over Volume. Quality Over Quantity. Our courses are not the cheapest available, and they never will be. This is training for medical procedures, in a field of expertise that can earn a physician or clinic hundreds of thousands of dollars a year in income and provide tremendous value to their personal and professional lives. Training should never be seen as a stepping stone, but as an investment. 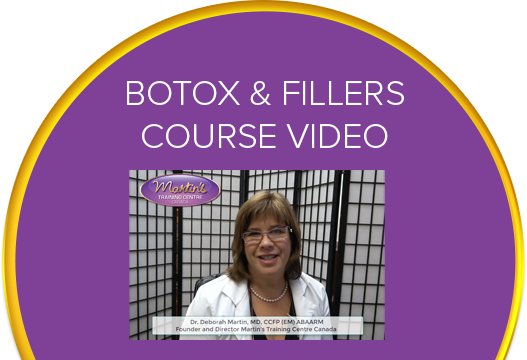 Many of the newly established medical training corporations offering training in Botox and Fillers have Doctors and nurses reduced to take notes while watching a live demonstration, and stampeding to be one of the lucky few who get to practice a few injections. That kind of training is not adequate for medical professionals. Every step of the training procedure is overseen; from educating clients, to evaluating the face, marking for injections, calculating dosages, angle of injections, and the appropriate distribution of the product. We sit as a group and thoroughly discuss YOUR issues including all the potential complications of treatment. Our demo patients are volunteers who trust us. As experienced physicians, we understand the value of training hands-on with real patients in an authentic clinic. The advantages are many. For instance, we have known most of the demonstration patients for years. They trust our experience and the fact that we will not expose them to anyone who is not properly and personally guided. In addition, our staff is present at all times to answer questions and provide solutions to situations that arise within a functioning Medical Aesthetics clinic. The clinic itself is a valuable teaching tool. We have nurtured our clinic for more than ten years; perfecting and simplifying systems to create the most professional, personal and efficient environment possible. Everything from the couches patients sit to wait on to the way in which we answer the phone has been examined, constructively criticized and tweaked. Many of our students say that just being present in the clinic has provided them with priceless information that they will incorporate into their new Medical Aesthetics practice. Nowhere is it written that education cannot be fun, and so we keep levity in the learning. Although we respect that the subject matter is serious, every report on teaching intelligent adults says again and again that a relaxed, pleasant learning environment works best. Our experience backs that up 100%. In our clinic, no subject is out of bounds, no question is stupid, all inquiring minds are welcome, and a sense of humour is much appreciated. We are not a faceless corporation. Our students are our friends and we welcome their questions long after they finish our programs. On that note, Dr. Martin has been frequently known to contact a former student, or the members of an entire class, weeks or even months after they have trained with us to bring to them the answer to a question. Sometimes a student was on the cutting edge, asking about a new technique that was at that time only available in the United States or Europe, and sometimes the question was from outside our realm of personal experience. We have maintained long distance relationships with many of our students from North America to the Bahamas to Australia... and the students frequently keep in touch with each other. We like to get to know our students personally as a colleague and often as a personal friend. By getting to know our students, just as we know all of our patients, we can come to understanding their wants and expectations; putting us in a better position to assist in steering them through the choices so that they will enjoy their work, avoid serious pitfalls, and profit the most. By participating in all areas of Medical Aesthetics, our students have the opportunity to assess their own skills in each area and then determine their best career path. It is for that reason that we stress the value of our Everything Course. Through the diversified curriculum, and the duration of that program, it becomes apparent where each student's natural aptitude is most prominent, and where best their skills can be applied. Our clients expect us to know about all areas of Medical Aesthetic; not just one part like laser or Botox. 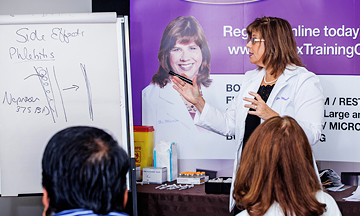 The Everything Course also best introduces students to all areas of Medical Aesthetics.